BAILEE- in FOSTER but Ready for FOREVER…. 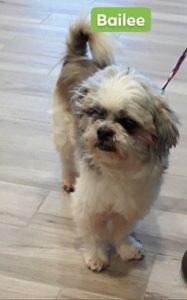 BAILEE is an adorable Shih tzu who came to Last Hope as a Babylon Shelter neglected stray found in Wyandanch. He was shaved for comfort & treated for a bad ear infection. His microchip revealed his real name but was a dead end disclosing his owner or age. He’s probably 6-8 yr old. BAILEE is now a foster with Last Hope volunteer family- the “Marvelous Murphys of Massapequa”. He is doing well after a dental extracting quite a few teeth, a small growth was removed from his eyelid and another inside his earlobe. He’s an absolute love. Very affectionate and housebroken.